About a month ago I received a DVD in the mail from Conrad Reich (great-grandson of Damiano and Oliva Genetti). The package contained a home movie of his parents’ wedding. This was certainly a treasured heirloom and I was very touched that the Reich family wanted to share it with us! I knew immediately the time had come to include video in the Gallery section of our website. And so I am pleased to announce our new Video Page is now up and running! I love old black and white films and I hope you do too! 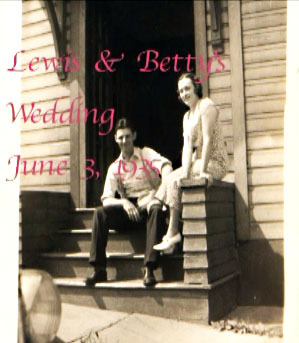 Many thanks to the children of Lewis and Betty Reich for contributing our very first video – an early home movie of their parents’ wedding dated June 3, 1935. Elizabeth “Betty” Zambotti Reich was the daughter of Tillie Genetti and Peter Zambotti, and the granddaughter of Damiano and Oliva Genetti. According to Conrad, all of Damiano and Oliva’s children are in the movie along with Oliva. What a thrill to catch a glimpse of my own great-grandmother! 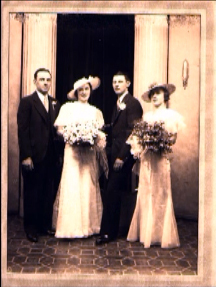 Lewis and Betty Reich on their wedding day, June 3, 1935, with their Maid-of-Honor and Best Man. To read the story of how the video was discovered, visit the Video Page and take a stroll down memory lane. Do you have an old family movie converted to DVD that you would like to share? Or have you already posted a video on YouTube? If so, contact me for shipping directions or with the YouTube embed link and we will do our best to publish it on the Video Page. I will also be searching YouTube for public videos showcasing the talents and businesses of Genetti family members. Watch for future blog posts announcing new videos finds! Our special thanks to the children of Lewis and Betty Reich (Conrad, Olivia, Ann Marie and Lewis) for sharing their family’s treasured memories. ← What Can a Death Certificate Tell You? Also a special thank you to Charis Hearn for providing the editing and production necessary to bring this video to life.